STORRS, Conn. — A University of Connecticut professor asserted that he came from an ape on Tuesday as he went wild during a campus gospel presentation that included discussion on evolution. 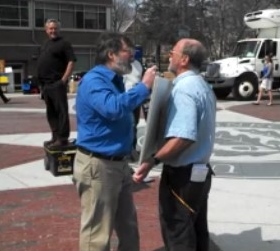 James Boster, Professor of Anthropology at University of Connecticut, spent over two hours attempting to draw students away from several evangelists that were open-air preaching and distributing gospel literature on campus. “He started to address the students as ‘My brothers and sisters of Darwin,'” he recalled. “I want you to join me in saying, ‘Praise Darwin! '” Boster declared, as the students echoed his refrain. “Amen!” he proclaimed. As Rappaport began preaching, Boster again became agitated, and at one point began shouting in Polish. 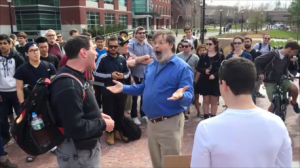 Rappaport said that although Boster claimed that he was now going to conduct “open-air Darwinism” on campus as a result of the preaching, he remained open to further discussion and was willing to exchange emails. Smith, a former prep school teacher and headmaster, expressed a concern for Boster’s soul and eternal salvation. “We obviously care about this professor and the students at UConn, and we long for them to find the liberty and freedom from sin in serving Jesus,” he stated. Boster could not be reached for comment.